What's new in the mountains this week? : A resort with issues. Economists will tell you "invest in the resort and the people will come." In Chamonix there seems to be the view: Don't Invest and the people will STILL come. People would joke about the "third world" lift system saying it just added to its charm. Then around the new millennium someone within the Powers that Be had the bright idea that they should target a "better class of skier." But not better skiers, just skiers with more money. It was theorised that people with more money generally only want to ski in the sunshine, so the logic was to reinvest in the lifts on the south side of the valley i.e. Le Brevent and La Flegere. and spruce up the center of Chamonix with some posh shops - hence the arrival of the Chanel Boutique- [which has now gone again.] So, firstly Flegere and Le Brevent were linked with a horizontal cable car thus creating a larger ski area . 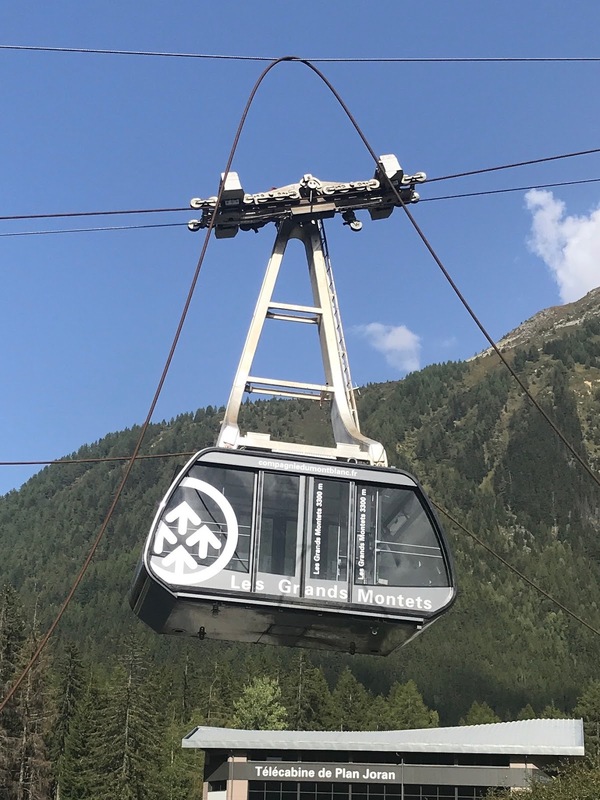 The Brevent /Plan Praz telecabine was rebuilt and a new Index cable car was installed. When it was pointed out that skiing on the south side meant the snow deteriorated quickly in the afternoon , the official thinking was wealthy skiers don't ski in the afternoon, they eat lunch. Yet the project was half baked because they never got the cafes and restaurants sorted out. The choice is laughable. At the top of la Flegere cable car there is a cafe called the Foehn. This is supposedly named after the Foehn wind, the same disastrous wind that frequently shuts the cable car leaving thousands of skiers trapped on the mountain very regularly. The decor inside The Foehn cafe gives a nod to the Eden Project with savanna grass like carpet stuck on the walls and spot lights that hang down like triffids. It sells insipid coffee and car-wash sponges purporting to be flavoured muffins at eye watering prices. In the same building down stairs there is a restaurant which provides DIY incinerators loosely based on table top barbecues. These barbacues have a two stage job. Firstly they allow you to burn your own meat and cheese which creates a thick impenetrable stench. The smoke then accomplishes the second job of completely blanking the jaw dropping view through the un openable windows. Over on Le Brevent there is La Bergerie, which is okay, but only as long as you don't go down stairs into the cafe where you will be treated as an inconvenient annoyance. The whole thing bumbled on for many years , then there were some big infrastructure warning signs that even a blind man galloping by on a horse would have seen. Firstly there was the high-season breaking down of the Eggs which traverse the Vallee Blanche from the Aiguille du Midi to Helbronner. Last year this made international news headlines. Many people went home with some memorable stories. For example , being plucked by helicopter in vertiginous rescue would be up there with anyone's holiday memories. Meanwhile others were "lullabied" to sleep in the Eggs. If that wasn't fun enough, on their eventual "hatching" the next morning they were presented with a free voucher for another complimentary trip. Yet it was arguably last winter which marked the start of the slippery slope. During a winter storm the cable which suspends the Eggs snapped sending the Eggs to the glacier floor. Next there was the saga of the Aiguille du Midi damaged cable. This, don't forget is one of the biggest generators of cash in France and it is meant to be the 3rd most popular "natural" tourist attraction in the world after the Pyramids and the Niagara Falls. Well the second stage broke down for the second time in six months. Firstly the tractor cable , which pulls the cable car up, was replaced. Soon it turned out to be rusty. Rumors flew about that this was because there had been corners cut in the sourcing of the cable. These were categorically denied. The new cable was defiantly sourced in Switzerland and this time the lorry transporting the bobbin did not get stuck under the railway bridge in Argentiere. The new cable was up and running by mid summer. It was during a routine check in mid July that a 60cm section was found to be damaged. Again rumors started flying - the most popular was that the permafrost had melted and the mountain had moved, causing the cable to be out of alignment. Whatever the real reason know one seems to know . What is agreed upon is that this won't be fixed until Christmas 2018 may be January 2019. 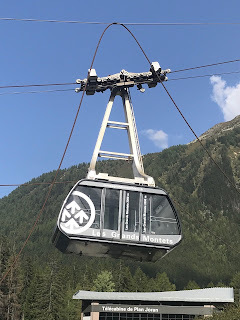 Moving across the valley to the other side of Chamonix to the Brevent , while the Plan Praz telecabine is the bench mark of a modern unit, the same can not be said of the Plan Praz /Brevent cable car. Presently the cable on this also being changed. It was at the point when they had completely dismantled it that the engineers had the eurika momment to experiment with a new tractor cable. Perhaps in the context it isn't surprising that they are struggling to get it up and running again? Moving along the valley we arrive at La Flegere. Regular users will be accustomed to the depressing queues which go with trying to shoe-horn skiers into a cable car that is no longer fit for purpose. As already mentioned it closes regularly due to the Foehn wind , but in addition the motor regularly burns out . At the head of the valley in the village of Le Tour it is universally accepted that the telecabine is in dire need of a new one. It was 'old' 30 years ago. Now the pylons are unstable and again rumors suggest that even the people who work on the lifts are scared to travel in the bubbles because they are worried that they will spontaneously self detach . There was and is a plan to rebuild the lift. It was to start from a slightly different place. A place that not everyone in the village could agree upon. There was a petition signed arguing that the new lifts departure point would disadvantage certain businesses. The whole project stalled and consequently there has been little economic alternative other than to put a "sticking-plaster" on the current lift and hope it gets through the next winter season. Moving back down the valley on the north side there is Les Grands Montets. This is considered by many to be " the jewel in the crown" of skiing in Chamonix. It has some of the best and steepest skiing terrain in the world. It is mythical. It was also the first resort in the valley to have "Ambassadors." These brave people are there to break the news to you that the whole Grands Montets experience is not going to be quite as good as you thought it was going to be. This is often because the queue is too long , or the lifts have broken down , or because the chief Pisteur detonated a preventive avalanche that ploughed through the middle of the Plan Joran Restaurant. This next season the Ambassadors are going to have even more to explain. The challenge will be to explain how the roof caught fire and destroyed the Lognan lift station, bringing down the cable and causing upwards of 40 million euros of rebuild. How the roof did catch fire is a matter of conjecture . But it all seemingly stems from cost cutting: The building needed a new roof but it was judged that patching it up would be fine. So a local contractor was employed to use a flame thrower to melt and spread hot tar over the biggest holes. Only it went wrong. Not all of the Grands Montets ski area will be closed and so the solution to the fact that the Grands Montets will be out of action for several years is to cut a track from the Bochard lift across to the col des Rachasses and let people walk. This is a novel way to reduce the queues. Time will tell if it catches on especially with the Monclair clad skiers from the sunny side of Chamonix. There will of course be many people who see the lack of a lift to the top of the Grands Montets as an opportunity. Now anyone who is prepared to get there under their own steam will have access to a pristine terrain and relative piece and quiet - so it is defiantly not all bad news. Get "What's New in the Mountains This Week" delivered automatically. Mark Seaton is a member of the British Mountain Guides and the French Mountain Guides Associations. He has guided out of Chamonix for over 26 years, during this time he has climbed and skied with people from all walks of life. He believes the most fascinating part of his job is seeing that each client is unique in that they all have completely different mountaineering ambitions. For example, on the one hand he was the first Mountain Guide to lead a blind man [with no mountaineering experience whatsoever] to the summit of Mt Blanc. While on the other hand he is one of the few Mountain Guides in the world to have guided a client up the North Face of the Eiger. Added to which he has worked for the BBC TV on several occasions, most recently as the camera safety expert for part of their seminal series “The Forces of Nature” which filmed the death defying Ibex climbing the Cingano Dam in Northern Italy. He is also the author of the successful Mark the Mountain Guide children's books which have been published in the UK, USA and France.